Playing with air in the Perris wind tunnelSo, they called your bluff, didn’t they? Just how many times did you square your shoulders and say, “Skydiving? I’d love to do that”. Did you really think they weren’t paying attention, or were you just listening to the ringing bravado in your voice? Now the family has fixed your little red wagon and given you a gift certificate, a virtual blessing to go and jump out of an airplane. You wonder about their motives and if there are strings attached, and if there are, hopefully, they’ll be firmly attached to you. What is it that motivates people to perform a death-defying act? Surely, stepping out of an airborne metal tube miles above the earth loaded only with a few yards of thin parachute fabric and a helmet full of hope and pixie dust, labels you as having lost a few marbles along the highway of life. But then, they probably said that about Orville and Wilbur, too. This, my friend, is the thrill of the ride. Here’s the adrenaline rush, the roiling taffy pull in your tummy and after several seconds of not breathing, the sheer excitement of daring to challenge your nerve against nature’s. Making the jump is easy the first time, mostly because you’re tucked up intimately close to your attached instructor, and that’s the person who makes the decision when to jump. You don’t get to say you’ve changed your simple little mind; it’s all about commitment to freefall at 120-miles per hour. For years, Captain Joe Matos was at the controls of a jet aircraft in commercial aviation. Now retired, he frequently flies skydiving enthusiasts out of Perris Airfield, watching the unique jumping formations of various clubs. At age 73 he thought he might like to do it but didn’t make the effort. Over at Perris Airfield, owner Ben Conatser said, “This will be the most exciting thing you’ve ever done. We offer the most modern and complete training program available. Our courses feature state-of-the- art equipment and are taught by professional staff members who have the highest credentials in the field of skydiving. One of the best facilities we have is the vertical Wind Tunnel where you can practice and master freeflying skills, by ‘playing’ with the air in a simulated environment. Families come to experience the flight chamber and the kids have a marvelous time using our birthday celebration facilities. It’s a fun activity even if you don’t go on and actually jump from the aircraft. Starting at $50 for an hour you can get suited up and receive training in the flight chamber plus a flight certificate for your wall. So what about safety, your paralyzed brain might ask? You should be aware that, like any sport, there is an element of risk. 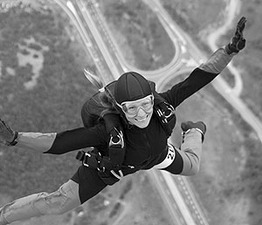 Check with the United States Parachute Association (www.uspa.org) to see if they have certified your choice of drop zone, as skydiving is self- regulated. Knowing that your parachute has an Automatic Activation Device that will release at a preset altitude should allay more fears and eliminate any more internal struggles. You can look forward to seeing your jump on the big-screen TV, then taking home the DVD to show all the sissies while you brag about how it was a piece of cake. You’ll be the family hero just like Captain Matos who, by the way, jumped dressed in his pilot’s uniform. Just another rite of passage. After all, the sky’s the limit and you have to make the first step even if it is from an aircraft door. 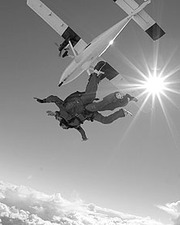 Tandem Jump and Tunnel Time $259.